Visit St Barts on a high-speed ferry from St Martin. Explore this fashionable, exclusive island during a 60-minute sightseeing tour, then enjoy French-inspired lunch and a harbor view at one of Gustavia's trendy bistros. Round out your full-day trip by spending time shopping, hitting the island's historic landmarks, watching the mega yachts or snorkeling at Shell Beach. Passport in hand (St Barts is a French territory,) make your way to the tour's departure point at Oyster bay or Marigot, depending on the day. Check in, show your documents and board the Voyager 3, a high-speed ferry. Take respite from the Caribbean heat in the air-conditioned cabin and purchase drinks on board if you like. The state-of-the-art catamaran is designed for a smooth sea-crossing, and the ride will take approximately an hour from Marigot or 30 minutes from Oyster Bay. Dismebark at St Barts to meet your local guide and get started on an hour-long sightseeing tour of the island. Visit all the highlights and landmarks of this exclusive island, stopping to snap photos and take in views along the way. 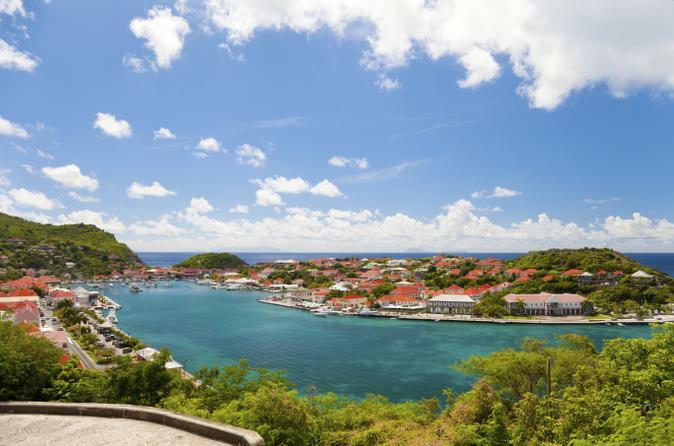 The tour ends in the capital of St Barts, Gustavia, where you'll lunch at a trendy local bistro. Sit on the terrace and enjoy views of the harbor while you eat island cuisine with a French influence. Return to the St Barts ferry terminal to catch your high-speed ferry back to St Martin.